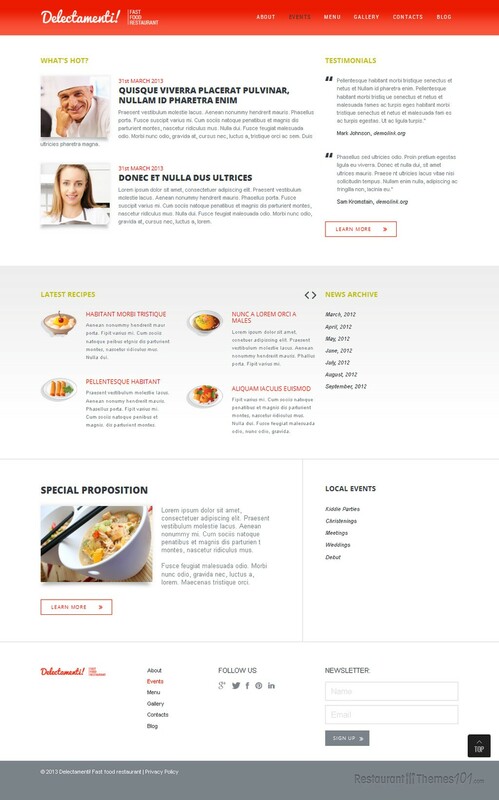 Delectamenti is a responsive Joomla restaurant template developed by Cerberus, and presented on Template Monster. This interesting looking template features a light layout design, with fresh colors and carefully organized boxes. The main color is white, with nice subtle red details, making sure your content is in the spotlight. A wide slider is featured on the homepage, making the perfect spot for showcasing interesting, delicious photos of mouthwatering food, bringing your visitors attention to your quality service and food. 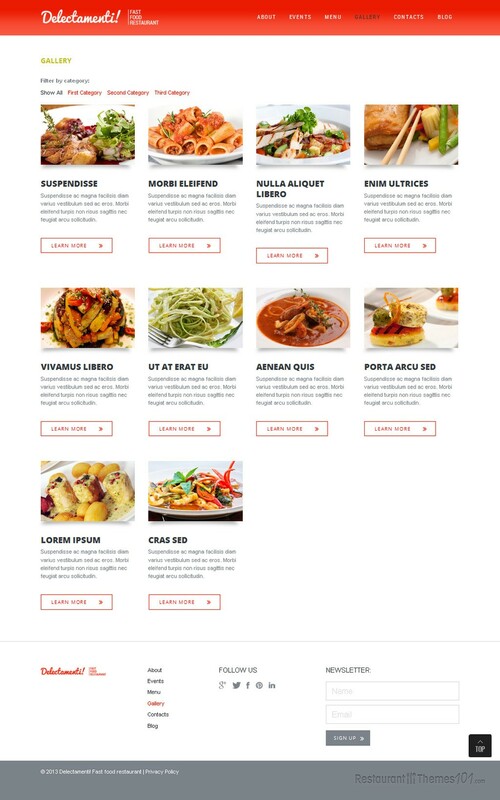 You can feature your special offers with resize photos and short descriptions right under the slider and by clicking on them, your readers will be redirected to a page where they can read all about the delicacy shown on the homepage. Feature even more content and nice offers in a slider form with thumbnail photos and some teaser text, which will be also linked to full content pages where your visitors can read all the details about your servings. Your news can be presented in a nice, readable way, and you can choose your favorite blog posts and feature them on the homepage, making sure your visitors are regularly updated to all the fresh info you have to share with them. 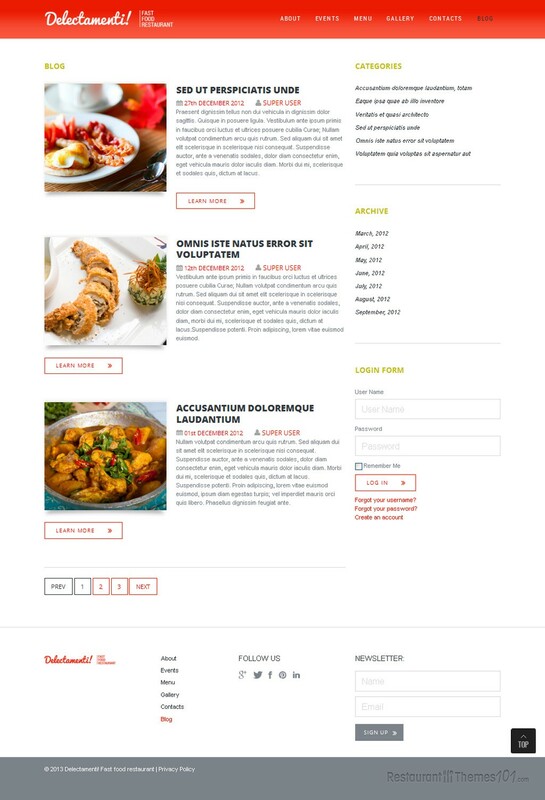 The menu looks great and very well organized, and it is very easy to create your own custom menu. A nice gallery is also included, for adding many quality photos and showing just how awesome your food looks, so your visitors are going to hurry and try out all the eye candy your present to them. 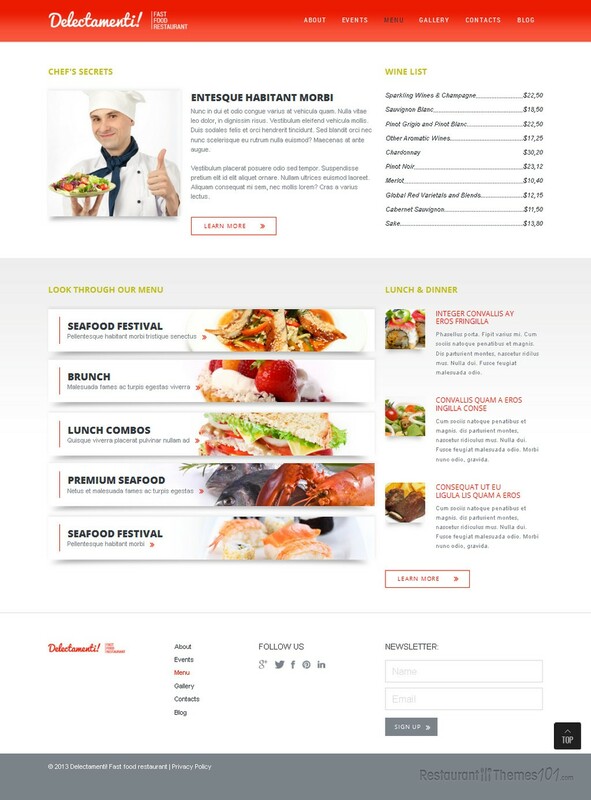 Delectamenti can be used as a fast-food restaurant Joomla template, or as a template for any other restaurant niche. It is completely responsive and your website will look great regardless of the size or resolution of the screen it is viewed from. It will look awesome even when seen from from mobile phones and tablets. It comes with installation and setup instructions, and you will be able to do it all by yourself, without the need of hiring a professional to do it for you.